In this transformational workshop originally created by best-selling author Louise L. Hay, You Can Heal Your Life® you will discover the mindset that has limited your success in business, financial abundance, intimate relationships, spiritual growth, and much more. The powerful and effective techniques we teach are very simple and easy to learn! CALL TODAY TO RESERVE YOUR SPOT IN THE NEXT CLASS. 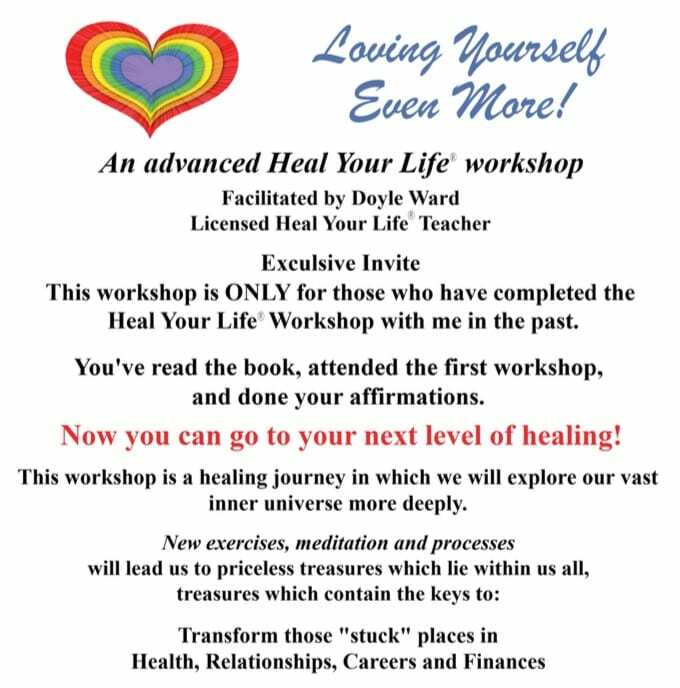 “A few weeks ago, Nolan and I went to a Transformational Workshop “You Can Heal Your Life” with Doyle Ward as presenter and Claudia Autry as assistant. We have attended many spiritual workshops, presentations and conferences through all our married years. Each one has been very inspirational and life focusing and helped us live a better personal married and family life together. We leave each experience feeling fulfilled and re-connected to our spiritual mission of reaching out to others and connecting in order to build faith, happiness, joy and inspiration in ourselves and others. Doyle’s workshop surpassed all the others in that it brought us a sense of profound peace through learning-to-forgive exercises. This 2-day workshop at the Spectrum Center in Houston was opened to others in this state and worldwide. We went as soon as we knew about it because it was a time for fulfillment in receiving God’s Blessings for us. If others have done this, you know how you can just feel the need for more.